What constitutes Harvard Business School alumni status? Where can I find contact information for sectionmates or classmates, or get a list of fellow alumni? Go to the HBS Alumni Directory to search for classmates by name, company, location, industry and many other categories of information. I am not an HBS Alumnus, how can I get contact information for HBS alumni? Unfortunately, we are unable to provide any information regarding HBS alumni to those who are not also alumni. When is it appropriate to use the Harvard Business School name or shield logos? Generally, alumni are not permitted to use Harvard Business School logos for any use including gifts, event materials, clothing, print & digital materials, etc., for their own non-school sanctioned events. Exceptions are made for school-sanctioned events (contact Alumni Communications) and Reunions (contact Reunions team), and alumni clubs-sanctioned events (contact the Clubs team). Transcripts and certificates of attendance may be obtained through MBA Registrar Services. For information, go to: https://www.hbs.edu/mba/registrar/alumni/Pages/alumni-transcripts.aspx. Replacement diplomas may be obtained through MBA Registrar Services. For information, go to: https://www.hbs.edu/mba/registrar/alumni/Pages/alumni-transcripts.aspx. How can I get a legal name change on my academic records? Information on a cross-reference or legal name change to your academic records is available through MBA Registrar Services: https://www.hbs.edu/mba/registrar/alumni/Pages/alumni-namechange.aspx. The LEFA system was retired at the end of 2017 and replaced by Microsoft Office 365. Your HBS email address that was previously called LEFA is now referred to as your HBS email address. The forwarding of email that previously happened inside the LEFA system is now handled by Microsoft Office 365. In addition, the login email and password that alumni use to access protected areas on the alumni website is no longer referred to as your LEFA login, but rather your HBS username and password. How do I change or update my email forwarding address in Office 365? The email address you would like your HBS email address to forward email to may be updated on the Office 365 Outlook Forwarding Page. Log in with your HBS username (formerly LEFA username) and password. I had Office 365 as an MBA student or Executive Education participant. Do I still have access to it? MBA Alumni who graduated in 2016 or later, and Executive Education alumni who graduate in or after 2018, received access to Office 365 as students. They will maintain access to a limited suite of Office 365 tools, including their Outlook mailbox, at https://o365.hbs.edu. I've forgotten my username. How do I retrieve it? Your HBS email address is also your HBS Username (e.g. jdoe@mba2007.hbs.edu) and coupled with your password gives you access to password protected areas of the Alumni Website. If you don't know your username, please contact the Alumni Records Office at alumni_records@hbs.edu or (617) 384-5977. Reset your password by using this Reset Your Password web page. From time to time you may receive emails addressed to your HBS email address that appear to be official messages from trusted sources, but are in fact fraudulent emails devised to extract sensitive, private information. Recent messages appear to come from ithelp@hbs.edu and state that your account has been blocked or suspended and threaten permanent removal or deletion of your account. Almost all such fraudulent emails urge immediate action. In addition they ask you to send your username and password. NOTE: HBS will never ask you to e-mail your password or other sensitive information. This type of fraudulent messages is often referred to as a "phishing" e-mail. Below are some steps to take to avoid falling victim of a phishing scheme. Be extra careful when you receive an email requesting sensitive data. HBS, banks, or any legitimate service will never ask for sensitive information through email. As a precaution, contact the company from which the email apparently originates (using a phone number from a statement or their official Web site, not any phone number provided in the email) to check that the email is legitimate. It bears repeating - HBS will never ask you for sensitive information via email. Hover over (but don't click!) any links embedded in the email. Frequently, a URL will look legitimate at first glance, but you will see when hovering over the link it actually goes to a fraudulent site. A common trick is to use a web address that appears to be legitimate but with some letters transposed (e.g. www.harvrad.edu). For more on phishing and other scams, visit https://news.harvard.edu/gazette/story/2017/11/harvard-expert-offers-best-practices-to-thwart-phishing-attacks/. If you receive a suspicious email, please forward the message to phishing@harvard.edu. If you suspect you may have provided your login information to another party, please contact the Alumni Records Office: 617.384.5977; alumni_records@hbs.edu. Why did I receive a spam message from my own HBS email address? The appearance of spam messages from your own e-mail address can be disconcerting, but it is not the result of a security breach in the HBS computer systems. The most likely cause is a virus attack on a personal computer of someone who has your HBS email address in their contact list or elsewhere on their computer. These spam viruses then "spoof" the e-mail return address by using an e-mail address found on the machine. Best practice is simply to delete the message. HBS IT is committed to spam protection and is continually reviewing and updating its techniques to slowing the flow of spam. To help HBS monitor the amount of spam messages reaching alumni, you may report spam here: alumni_spam@hbs.edu. What is HBS login and what can I access with it? The HBS login refers to the username and password combination needed to access the protected areas of the Alumni Website, including the Alumni Directory and Profile, Alumni CareerHub, Class Notes, and the Email Messaging Service. What is Harvard Key and what can I access with it? HarvardKey is the University’s new username and password credentials needed to access non-HBS Harvard alumni services. It applies to services linked from alumni.harvard.edu. As of September 22, 2015, your previous alumni.harvard username and password no longer grant access to Harvard alumni services. Can I use HBS login for alumni.harvard.edu website? HBS login does not grant access to alumni.harvard.edu services. HarvardKey is required to access. Can I use the Harvard Key to access the alumni.hbs.edu website or HBS club websites? The HarvardKey does not grant access to alumni.hbs.edu or the HBS club websites. HBS login continues to be the username and password combination necessary to access HBS alumni services. Can I use my HBS email address as the email address for Harvard Key? While you could choose to use your HBS email address as your username for the HarvardKey system, the username and password are not shared with the HBS login credentials. Where can I learn more about Harvard Key? What is the Alumni Messaging Service? The Alumni Messaging Service is a safe and reliable way for you and other alumni to send email messages to individual alumni and to ad-hoc alumni groups you might create using the Alumni Directory. The service helps safeguard alumni communications from the ever-changing rules that Internet Service Providers impose on forwarded email (many are blocking it) and gives you fine control over the types of messages you'd like to receive from classmates and other alumni. With this service, you are able to opt out of or opt into categories of message purposes that will guide the nature of emails you receive from other alumni (examples: Business Deals or Keeping In Touch). These message-purpose options are found in the Preferences tab of your alumni profile page. Building on the Email Your Class/Section tool, the Messaging Service replaces the formerly used LEFA links with envelope icons and a prompt to "send a message." Clicking on "send a message" opens a window with a form for you to compose your message. The new service sends messages to the recipient's preferred contact address. What are messaging purposes and how do I edit my own? Messaging purposes are category designations that allow you to control the types of messages you receive from others in the HBS community. They currently include: Business Deals, Current Opportunities, Consulting Offers, Expertise Requests, Job Inquiry, Keeping in Touch, and New Ventures. They may be edited in your alumni profile under the Preferences tab. If I create a large message group, is it possible that some people will not receive the message if they opted out of certain messaging purposes? That is correct. Since you choose recipients before selecting a messaging purpose, it is possible that some in your initial selection are not interested in receiving messages with the message purpose connected to your message and thus they will not receive your message. How do I send a message to my class, section, a group of alumni? To send an email message to your class or section, click on the Email Your Class link on the home page listed under Quick Links. You may then choose the appropriate class or section from the “Choose Your Audience” drop down in the “To” field. Sending an email message to a group and an alternate method to sending to your section, begins with the Alumni Directory. The first approach starts with the Like You common searches adjacent to the search boxes in the Alumni Directory search screen. You may select alumni in your section, alumni with a similar interest, or who live near year. If the result set is 100 or fewer, the envelope icon at the top of the results list will become an active button. If the result set is greater than 100, use the search refiners to narrow your search. How do I send a message to just one person? Throughout the alumni website, where LEFA links once appeared, you will now see envelope icons (✉) with a link to “send a message.” These appear in the Alumni Directory, in an Alumni Profile, and in Stories. Clicking on these links will take you to the Alumni Messaging Service and will allow you to send a message directly to the recipient’s preferred contact email address. Where did the LEFA links go? As an increasing number of Internet Service Providers (ISPs) stop forwarded messages and mark them as SPAM, HBS has chosen to provide an alternate method of sending messages to fellow alumni. We have thus removed LEFA link references from profiles and throughout the Alumni Website. The HBS email addresses (formerly LEFA) are still active and still forward as long as the receiving ISP allows it. Where LEFA links once appeared, you will now see envelope icons (✉) with a link to “send a message.” This will take you to the Alumni Messaging Service and will allow you to send a message directly to the recipient’s preferred contact email address. What happens if I send an email to an HBS email address/LEFA? HBS email forwarding addresses are still active and still forward as long as the receiving ISP allows it. If I reply, will everyone see my response? No. A reply to a message which originated in the Alumni Messaging Service will be sent back to the sender via email. There is no reply-all function. If someone replies to a message I send, where will I see that reply? Replies to messages sent through the service will be emailed to the sender's preferred contact address. Why can’t I send a message to everyone in my search results list? We have set a limit of 100 recipients per message. Do I need to have a contact email address in my alumni profile to use the Alumni Messaging Service? Yes. A valid contact email address is necessary to send a message using the Alumni Messaging Service. Your fellow alumni need to have someone to reply to. I encountered an error using the Alumni Messaging Service. How do I report it? Please contact Alumni Records via our feedback form or email with as many specifics as possible (screenshots are very helpful). You may update your address and any other information in your Alumni Profile. How do I change my legal name in my Alumni Profile? This type of update requires a special request to the alumni information group. Submit the request here. How do I change my gender in my Alumni Profile? How do I change my class year so that I can attend reunions with the class I started with in my Alumni Profile? I can’t find my undergraduate college when I update my profile. How can I add it to the list? My HBS volunteer role isn’t appearing in the HBS Volunteering section, how can I update it? How do I subscribe/unsubscribe from HBS emails? You may edit your email subscriptions on the preferences tab of the Alumni Profile. Can alumni use Baker Library? Alumni may use Baker Library on site, free of charge with a Baker Access Card. How can I get a Baker Access Card? Alumni may obtain an access card at the Stamps Reading Room Service Desk, located on the third floor of Baker Library. Please bring photo ID. For more information, go to: http://www.library.hbs.edu/info/whocanusebaker.html. How do I make an appointment to visit Baker's Historical Collections? Fill out the online Historical Collections Reference Request Form at http://www.library.hbs.edu/forms/hcref/, or contact the Historical Collections Reference Staff at 617.495.6411. What is eBaker and how can I access it? eBaker is an online collection of free information research resources for alumni. eBaker also offers a deeply discounted annual subscription to OneSource. For details, go to eBaker. Why can't I get into ABI/ProQuest? Go to ProQuest Cookie Cutter. Click on "Click here to reset your browser." Do not click on any of the choices that come up after that, but go back to eBaker Home. Click on the ABI/ProQuest "Go to Database" link from the A-Z list. Do the ProQuest Browser Health Check. If you get a referrer URL warning, then click on the Firewall Section link to access ProQuest's information on how to enable the referring URL. I can't access one of the resources — what should I do? Please contact us and let us know which resource you are trying to use and what message you are getting when attempting access. How do I submit Class Notes? Alumni may submit Class Notes through the Submit a Note feature in Class Notes. How do I submit a photo for Class Notes? The Submit a Note feature in Class Notes also allows you to submit photos. What are the guidelines for Class Notes submissions? How do I find out who is my class secretary? Your secretary is listed at the top of your Class Notes in each issue of the Bulletin. You may also contact Class Notes directly at class_notes@hbs.edu. Story ideas, as well as comments and feedback may be submitted. Submit a Story. HBS offers personal and self-paced audio tours of the Soldiers Field campus. For schedules and information, go to: http://www.hbs.edu/mba/admissions/visit.html#tour. Is there a map of campus? There is an interactive map available online: http://www.hbs.edu/maps/. I’d like to bring a prospective student to campus to see what the case method is like. Which HBS facilities can I use? Alumni can obtain on site access to Baker Library with a Baker Access Card. For more information and a list of services and resources, go to: http://www.library.hbs.edu/resources_alumni.html. HBS alumni are eligible for membership at the Shad Hall fitness center. For fee information, call the fitness desk at 617.495.6060. Click here to download a membership form. What are the hours of the COOP? HBS alumni may use the Class of 1959 Chapel for weddings and memorials, through the sponsorship and coordination of HBS Alumni Relations. For more information, e-mail the Alumni Relations Office at alumni@hbs.edu. Donors to HBS, particularly alumni in reunion classes, can make pledges to be fulfilled at a later date. Guidelines for payments differ for reunion and annual giving pledges. Pledges must be made by June 30 following the reunion and should be fulfilled by the following December 31. Pledges must be made by December 31 following the reunion and should be fulfilled by the following June 30. Must be paid by June 30th fiscal year close to be counted in giving totals and listed in the School's Contributors Report. Special payment arrangements can be made for larger gifts. For further information, please contact Kerry Cietanno, Director of Donor Relations at 617.495.6889 or kcietanno@hbs.edu. Will I get credit for pledge payments? Donors will be recognized in the School's annual Contributors Report for the full amount of a pledge in the year that it is made, regardless of payment timing. Pledge payments made in subsequent years will not be listed. A donor may request that he or she be recognized for payments as they are made over more than one fiscal year. Will my gift to HBS be automatically credited to my class? Joint crediting is an option but is not automatically applied. Couples must indicate if they would like their gift to be entered jointly, in which case the amount will be split 50/50 for tax purposes but each person will receive class credit and recognition for the full amount of the gift. Please contact Development Operations at 617-495-6207, or email gifts@hbs.edu, for further information about crediting. What is the crediting policy for planned gifts? HBS will give credit to the donor and donor's class for the full face-value of an irrevocable life-income gift. Such credit is given also for a bequest intention, properly documented, in the 50th reunion or later. How do I take advantage of my company's matching gift program? Please use our online search tool or contact your company's human resources office to find out if your employer matches charitable gifts and to learn the associated policies and procedures. For more information, visit Corporate Matching. What is the School's Federal Tax Identification number? When will I receive a receipt for my gift? You can expect to receive an official receipt in 10-15 business days after HBS receives your gift. To request a duplicate receipt, contact Harvard Alumni and Development Services at 617.495.1750 or email ads@harvard.edu. Is there an HBS club near me? The interactive map on the HBS Clubs Web site is an easy way to locate the club nearest to you. Go to: https://www.alumni.hbs.edu/clubs/Pages/clubs.aspx. Can I join the Harvard Club? Harvard Club membership is open to all alumni of the University. Each club offers its own a variety of programs, services, and opportunities to its members and to its communities. For more information and to find a club near you, go to: http://alumni.harvard.edu/haa/clubs-sigs/clubs-directory. Do HBS alumni receive special discounts on the Harvard Business Review? FREE Online Access: Alumni receive online access to the current issue and over 2,800 articles from back issues. HBS Alumni may use their HBS email address to gain access to the Harvard Business Review by following the procedures outlined here. Alumni Subscription Discounts: HBS Alumni may also receive a discount on the magazine subscriptions of the Harvard Business Review. Visit http://hbr.org/hbsalumni for details and to subscribe. Can HBS alumni attend Executive Education programs at a discount? HBS offers more than 60 executive development opportunities for alumni to return to the campus to reconnect with HBS faculty, recharge their leadership capacity, and interact with an array of leading executives from around the world. Alumni qualify for an exclusive 30 percent discount on nearly all open-enrollment HBS Executive Education programs. This offer is available to HBS alumni only; is nontransferable to colleagues, partners, or other company executives; and is subject to the standard HBS Executive Education admissions requirements. The discount is applicable to HBS Executive Education open-enrollment programs only, and cannot be applied to alumni-only programs. Are there more discounts and offers for HBS alumni? Join the COOP for a $1 annual fee and get 10% off on all purchases. All Harvard Magazine content is available online for free. To search class notes and obituaries, login is required. The Credit Union offers a variety of products and services to the Harvard community. Designed exclusively for Harvard alumni, the card offers cash back and travel rewards, plus no annual or foreign transaction fees. In turn, revenue from the card supports financial aid. Enjoy savings on select ThinkPad notebook computers. Enjoy a group discount on membership to Zipcar in your city. Learn more about alumni services available to all Harvard alumni. You can also import information from your LinkedIn profile to your HBS alumni profile. Learn more below. Is there an alumni travel program? Yes. For information on alumni travel programs exclusively for HBS alumni—including schedules and trip itineraries—go to: Harvard Alumni Travels. What is the HBS Nonprofit/Public Sector Loan Repayment Assistance Program? The HBS Nonprofit/Public Sector Loan Repayment Assistance Program can help reduce the need-based educational debt repayment burden for alumni taking managerial positions in the US or abroad where salaries may be below the MBA average. Qualified graduates from the MBA Class of 1999 onward are eligible to apply. Learn more. You can learn about other opportunities for alumni offered by the Social Enterprise Initiative at Alumni for Impact. How can I contact other alumni if I have a special need to reach out? When facing difficult challenges in life, it is only natural to turn for support to the people who have been there for you throughout your life and career—your HBS network. The HBS community is a valuable resource that can be helpful in myriad situations. What follows are some suggestions for how best to access the HBS network in times of need. Class Notes: Many alumni have shared news to garner support or solicit advice from their peers. Your Class Notes secretary can send a message to your classmates or section mates, help you reach out to them directly, or include a mention in an upcoming column. Alumni Messaging Service: Through the alumni website, you can send an email to your section, class, or other groups of alumni. Please be aware that the messaging service’s terms and conditions prohibit the use of the service for fundraising or soliciting financial support for your cause. Faceted search of the alumni directory: HBS alumni are leaders in every industry and searching the alumni directory and searching within the Employment categories can lead you to alumni who are experts in every field or who have resources or connections that may be of assistance. Social media: Many alumni connect through social media networks. The HBSAlumni group on LinkedIn is open only to HBS alumni, making it a particularly good way to reach out to other alumni in a particular field of interest. Clubs and shared interest groups: HBS alumni clubs and shared interest groups, such as the Healthcare Alumni Association, are powerful networks that can connect alumni to others in their region or a particular industry. What’s new in the new Alumni Directory? Watch this short video to see a demonstration of all the new features of the Alumni Directory, including using the search filters and how to print or download your classmates contact information. Can I see some Alumni Directory sample searches? Search by location: Try searching for alumni located in Hawaii. In the Directory type Hawaii in the location search box and click SEARCH. The default results display will be the list view. Click the Map icon above the results to see the Map view. Then use the map’s zoom tools to narrow the results to a more precise location. Search by job title: Filter your search to find alumni in a specific position. For example, try searching for alumni who self-identify as a CEO located in New York City. Again, click on the “View as Map” link to see your results, then zoom in to find alumni in, lower Manhattan versus Midtown. For more information and a video tutorial: Visit the What’s New in the Alumni Directory page. Where do I find the feature that was previously called COMMONLY USED SEARCH? 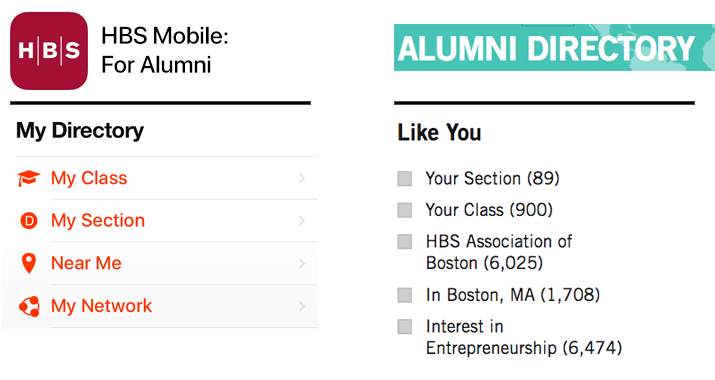 On the home screen of the HBS Mobile app under “My Directory” and adjacent to the search boxes in the Alumni Directory under “Like You” we have gathered some commonly used searches. What is “alumni directory mapping”? Mapping of addresses in the Alumni Directory (on the website and in the mobile app) lets you easily search for and find on a map HBS alumni who live or work in a specific city or country as well as identify other alumni who are in your vicinity, whether you’re at home, at work, or travelling. This is a feature many HBS alumni have asked for and it has been made possible by recent upgrades to the Alumni Directory database. You must be logged into the alumni website or mobile app to use this feature. Whether you’re on the road, at work, or at home, you can now easily find other alumni who live or work close to you, filtered by their address as well as their industry or job title or their program and class year. It’s just one more way we’re helping alumni make connections and expand their networks. Using Google Maps and Apple Map in the case of the iOS app, the mapping tool lets you search by specific location or base your search on your current location. By choosing one of the preset search functions or refining that search further using the filters provided, you can find nearby alumni based on the business or home addresses listed in their Alumni Directory profiles. The mapped results of your search are as specific or generalized as the information alumni share in their profiles. Does this work on any computer? The new directory mapping tool works on your personal computer or mobile device. In fact, the HBS Mobile app makes it even easier to use on your smartphone enabling you to connect with other alumni when you’re travelling. Which locations will the map show? The map results will display whatever you or other alumni have selected to show as your home or business addresses in the Alumni Directory. If you choose to display the full address, the Google Maps tool will identify that location. If you choose to show only your city or country in the directory, the map will provide a generalized identification of that location. Can I adjust how my address is shown? We have taken steps to ensure the privacy of your personal information. As with other information in the Alumni Directory, you may change how your addresses display at any time by editing the preferences on your profile page. We encourage you to update your directory profile now to ensure the mapping results align with your preferences. We also suggest that you complete your profile by identifying your industry and topic/interest preferences, as these also will improve your ability to connect with fellow alumni as well as aid your personalized experience on the alumni website. How do I change my visibility preferences? The Edit Profile page allows you to set your level of visibility in the Directory and on the map, including your full address, city, and country. You may also suppress the address entirely. In addition, on the , Preferences tab of the Edit Profile page you may choose to show or hide your home address or your business address. Why do I see two pins when there is only one alumnus/a in the area? Both work and home addresses may be displayed for alumni who choose to display both. How does the Directory know where I am currently? The “Near Me" button is based on the IP address of your computer, smartphone, or tablet. Why am I prompted to share my location? The Alumni Directory is using Google and Apple iOS to map the location of your IP address to enable location-relevant search. If we can not find your IP address you may be asked to share your location using your device’s GPS locator. If you do not share your address, you may not have access to the complete geolocation functionality. Please note: we do not store your location in these instances; the request is only used for that individual search query. I have a seasonal address; will it be mapped? Your seasonal address will temporarily replace your home address during the date range you selected. The map will likewise reflect these settings. On the left side of the Alumni Directory, as well as on the alumni homepage, there is a feedback tab. You may use it to let us know what you like or what you may not like with the Alumni Directory or any part of the alumni website. How do I import information from LinkedIn to my HBS Alumni Profile? Next time you log in on the alumni homepage, click the "Connect to LinkedIn" link on the pop-up prompt (you may have to disable pop-up blockers) to authorize HBS to copy data from your LinkedIn profile to your alumni profile. You can also find the “Connect to LinkedIn” link when you’re logged into your alumni profile page. Contact information, employment history, education, interests, about me, and photo are imported from LinkedIn. Your profile may be refreshed from LinkedIn each time you return to your profile if the cookie is still active (up to 90 days) or you can perform a manual refresh. How do I perform a manual refresh of my LinkedIn information? Can I choose which information I want to import? Yes, during the process, you can select which information you would like to exclude from the import. You always have the ability to keep previous information from Alumni Profile that isn’t in LinkedIn. Why did my photo, volunteer, or education record not import immediately? Photos, volunteer, and education are manually verified by Alumni Records and will often take a few business days to appear in Alumni Profile. Note that degrees from institutions other than Harvard can be imported only if they are accompanied with a year. Photos also have a minimum size requirement of 150px wide and 158px high to be imported into the Alumni Profile. Can I disconnect LinkedIn from my Alumni Profile? 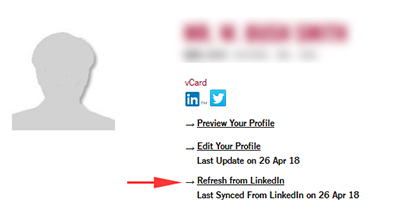 Yes, in the preferences tab on Edit Profile, there is an option to disconnect LinkedIn from your Alumni Profile. I encountered an error during the import. How do I report it? To receive the same online benefits of subscribers to the Harvard Business Review, alumni are now required to register, via the simple and free process outlined below. On the access code registration page, you will need to enter your HBS email address and Access Code: hbsalumni (all lowercase letters) and click on "Lookup." The next page will ask you to enter your First Name, Last Name, HBS email address* and Access Code: hbsalumni (all lowercase letters) and click on "Validate." If you happen to Log Out, you just need to use your HBS email address and password to sign in. If you have completed the registration, then you may access the HBR directly: http://hbr.org/.